During foraging walks, which last around three hours, we will be identifying, picking and eating a number of delicious edibles that present themselves along the way. There will be discussion about seasonal eating and the nutritional values and medicinal use of plants. We will also look at the conservation of species and their habitats, what to take and what to leave. And of course there’s use and storage of wild food, recipes and lots, lots more. Some foraging courses take place in Bristol or the surrounding area and others happen further afield; Bath, Clevedon, The New Forest or South Wales. To arrange a walk near where you live, for a private group, be it a stag or hen do, company away day or if you have any ideas for a foraging related event, please contact me directly. 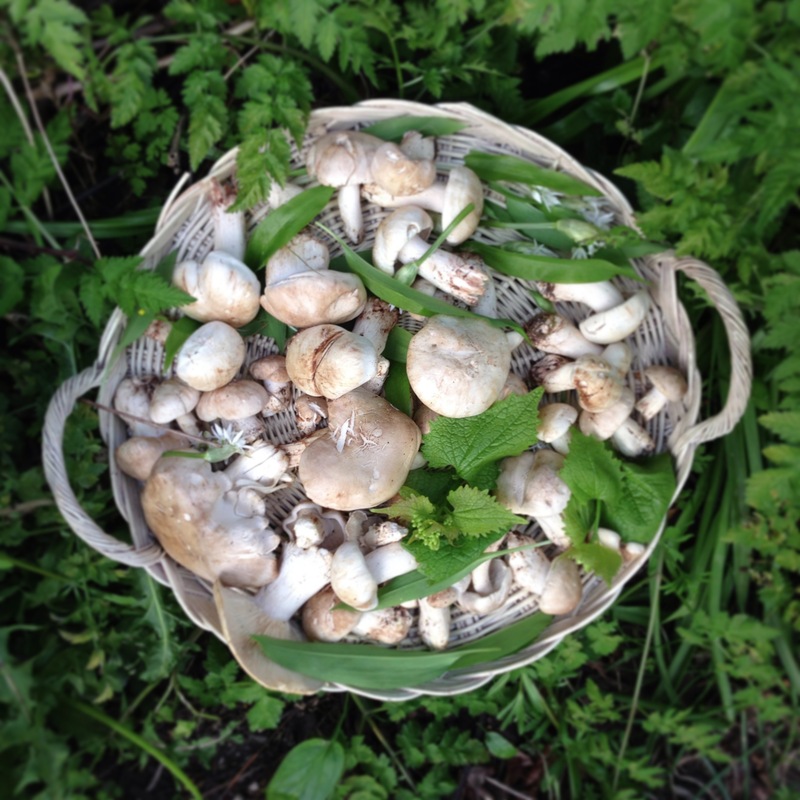 I have previously taught chefs and regularly deliver foraging walks and courses to schools, scouts groups, forest schools and other youth organisations. A foraging day in Stroud (location tbc). Discovering and foraging seasonal wild edibles in beautiful surroundings, then enjoying a wild food lunch back at Star Anise Cafe. There’ll be discussion around what to eat (and what not to eat), where to look, cooking, prep and storage of wild food, ecology, folk law, food as medicine and lots more. No charge for children under ten, £10 for 11-18 year olds. On this wild food walk we’ll discover all sorts of delicious edibles growing along the estuary in Bristol. Learn plant stories and how country folk have long valued wild herbs for their capacity to heal and promote good health, plus you’ll be given some ideas for how to turn your foraged ingredients into scrumptious meals. During the day there’ll be a chance to sample some tasty bits I’ve made from wild ingredients- wild kimchi or wild garlic frittatets or something else I make on a whim the night before. I’ll also provide some refreshing cordial made from wild flowers. Bring a friend, a camera and a sense of adventure. A foraging walk around Blaise Community Garden. Discovering and foraging seasonal wild edibles, You’ll learn about what to eat, and what not to eat, where to look, cooking, prep and storage of wild food, ecology, folk law and lots more. After our walk we’ll make wild pizza in an outdoor oven using our foraged ingredients. There’ll also be herbal infusions, pickles and ferments to enjoy with our lunch. Discover and eat some of the delicious wild edibles growing in coastal and salt marsh habitats, plants which shaped the lives of our hunter-gatherer forefathers and the menus of many a gourmet chef today! We’ll search for Sea Asters, Sea Arrow Grass, Sea Radish, Scurvy Grass, Sea Spinach, Rock Samphire and many more wonderful species. You’ll find out ways in which you can turn your foraged herbs and succulent sea veg into scrumptious meals and delightful condiments for use all year round. These walks are popular so don’t delay, book today! Afterwards we’ll feast on a forager’s picnic with sourdough, relish, elderberry dressing, ferments and herbal teas, all made from wild ingredients. A day of seaside foraging, looking at nutritious and very delicious wild plants and seaweeds. After the walk we’ll enjoy a forager’s picnic of ferments, pickles and other delights made using coastal vegetables and seaweeds. On our mushroom hunts we will look at safe identification of fungi, preferred habitats of different species, what to eat and what not to eat plus I will give you some ideas for turning your foraged ingredients into tasty meals. You can sample some of my wild ferments and mushroomy snacks plus hot drinks will be provided. On our mushroom hunts we will look at safe identification of fungi, preferred habitats of different species, what to eat and what not to eat plus I will give you some ideas for turning your foraged ingredients into tasty meals. You can sample some of my wonderful mushroomy snacks and hot drinks will be provided. Create your own wild and wonderful ferments with organic veg plus wild seeds and seaweeds. Fermenting has changed my life, brought new and exciting flavours to almost every meal I eat and played a big part in restoring my health. I’ll show you how to make some favourite krauts then you’ll come up with your own unique ferments that you can take home, love and devour! A foraging day in The Slad Valley, Stroud. Discovering and foraging seasonal wild edibles in beautiful surroundings, then enjoying a wild food lunch back at Star Anise Cafe. There’ll be discussion around what to eat (and what not to eat), where to look, cooking, prep and storage of wild food, ecology, folk law, food as medicine and lots more. No charge for children under ten, £10 for 11-18 year olds. On this wild food walk you will learn about all sorts of delicious edibles growing in the park. We will look at seeds, berries and fruit which can be foraged later in the season and put to good use in the kitchen. There will also be discussion about the medicinal uses of plants, many of which can be used to help build resistance to colds and flu during the Winter months. As well as all this, We’ll be searching for bee friendly, nectar rich flowers that support urban bee colonies. Bring a friend, a camera and a sense of adventure. On our walk you can sample some of my tasty wild kimchi, pesto, pickles etc, all made from wild ingredients. A foraging walk at Blaise Estate. Discovering and foraging seasonal wild edibles, You’ll learn about what to eat, and what not to eat, where to look, cooking, prep and storage of wild food, ecology, folk law and lots more. After our walk we’ll head to The Blaise Community Garden where there’ll be a chance to sample all sorts delicious food made outdoors on the day from produce grown in the garden as well as foraged on our morning walk. 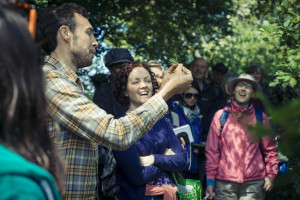 On this wild food walk we’ll discover all sorts of delicious edibles growing in the park. Learn plant stories and how country folk have long valued wild herbs for their capacity to heal and promote good health, plus you’ll be given some ideas for how to turn your foraged ingredients into scrumptious meals. During the day there’ll be a chance to sample some tasty bits I’ve made from wild ingredients- wild kimchi or wild garlic frittatets or something else I make on a whim the night before. I’ll also provide some refreshing cordial made from wild flowers. Bring a friend, a camera and a sense of adventure. Joining forces with Earthwise for a spring forage and feast! We’ll be having fun picking lots of different wild leaves, flowers and seeds, all of which you can eat! We’ll then head back to our yurt kitchen for some wild snacks and cordials and get the kids cooking a delicious lunch from our foraged ingredients. All food prepared on the day will be vegetarian and will be made according to the dietary requirements of the group. This is sure to be a fantastic experience for both parents and children to have fun learning about foraging and some kid-friendly cookery! Discover numerous, seasonal wild plants that can be foraged during Springtime. Learn what’s good to eat, as well as what not to eat, plus take home some seasonal recipes with which to impress your friends. There’ll be a chance to nibble on plants foraged along the way and also to sample my tasty, home made cordial made from wild ingredients. Plants we can expect to see include Wild Mint, Aromatic Alexanders, Sorrel and Pennywort. This location also has stunning views across the Severn Estuary. Join us at The Community Farm where we’ll explore springtime hedgerows and wilder areas of the farm. You will forage your own tasty leaves and shoots, learning what’s in season and good to eat now. At the end of our walk we’ll enjoy a wild food picnic including ferments and pickles, sourdough bread and wild herbal infusions. Discover numerous, seasonal wild plants that can be foraged during spring time. Learn what’s good to eat, as well as what not to eat, plus take home some delicious recipes with which to impress your friends. There’ll be a chance to nibble on plants foraged along the way and also to sample my tasty, home made herbal tea blend made from wild plants plus I’ll bring some warming wild soup and sourdough bread plus hot drinks. Plants we can expect to see include Nettles, Wild Garlic, Ground Elder, Meadowsweet and Hawthorn. Learn to make Kimchi and Kombucha with me and fellow fan of all things fermented Shumbi Love. At the end of the session you’ll come away with some fabulous pots of pro-biotic goodness to share with your family and friends! Lunch, including various ferments made from wild and organic ingredients, will be included. On these walks we will discover and eat some of the delicious edible plants growing in coastal and salt marsh habitats, which shaped the lives of our hunter-gatherer forefathers and the menus of many a gourmet chef today! Some plants I have previously found on these walks are: Sea Asters, Sea Arrow Grass, Sea Radish, Scurvy Grass, Sea Spinach, Rock Samphire and Black Mustard. On our walk you can sample some of my tasty chutneys, vinegars, syrups etc, all made from wild ingredients. Learning in the fresh air; have fun picking lots of different leaves, flowers and seeds, all of which you can eat! Discover things you never knew about the plants growing right under your nose – in the park. With a super forager’s quiz and a chance to taste the things I make from the things I find – like my yummy Elderflower cordial. This foraging walk will last around one and a half hours. Although aimed at children these walks will have lots of interesting information for adults too. (suitable for ages 3 and above). Grown ups welcome but must be accompanied by a child (limited to one grown up per child). On these wild food walks we’ll discover all sorts of delicious edibles growing in the park. Learn plant stories and how country folk have long valued wild herbs for their capacity to heal and promote good health, plus you’ll be given some ideas for how to turn your foraged ingredients into scrumptious meals. During walks there’ll be a chance to sample some tasty bits I’ve made from wild ingredients- wild kimchi or wild garlic frittatets…or something else I make on a whim the night before. I’ll also provide some refreshing cordial made from wild flowers. Bring a friend, a camera and a sense of adventure. Join us for a morning of foraging at The Community Farm, in Somerset. During the walk we will explore the hedgerows and wilder areas of the farm. You will forage your own tasty leaves, learning what’s in season and good to eat right now. After our walk we’ll enjoy refreshing drinks, delicious wild kimchi, pesto, sourdough bread plus pickles. It doesn’t matter whether you have experience of foraging or you are completely new to the subject, you’re sure to find this an enjoyable and interesting day – bring a camera, some comfortable footwear and a friend. Booking through The Community Farm. Discover numerous, seasonal wild plants that can be foraged during Springtime. Learn what’s good to eat, as well as what not to eat, plus take home some seasonal recipes with which to impress your friends. There’ll be a chance to nibble on plants foraged along the way and also to sample my tasty, home made herbal tea blend made from wild plants plus I’ll bring some warming wild soup and sourdough bread. Plants we can expect to see include Nettles, Wild Garlic, Ground Elder, Meadowsweet and Hawthorn. I’ll bring hot drinks. Discover aphrodisiac potions, heart tonics and wild cocktails to get your valentines evening off to a flying start. There’ll be a few nibbles to enjoy along the way and soft drinks for anyone driving! Discover edible salads and wild herbs growing in this tranquil green space near the heart of the city of Bath. Walking in picturesque surroundings, discover numerous tasty wild plants growing in our urban green spaces. During the walk we’ll discuss how to create delicious meals from wild ingredients you’ve foraged, plus we’ll look at plant families, habitats and lots more. There’ll also be a chance to sample some of my homemade pickles, fermented wild leaves and Elderberry cordial. Exploring one of Bristol’s great treasures and a haven for wildlife, discover numerous tasty wild plants growing in our urban green spaces. Learn about plant families, the hidden habitats of Brandon Hill Park and discover its edible secrets. During the walk I will talk about how you can create delicious meals from wild ingredients that you forage. There’ll also be a chance to sample some of my homemade pickles, fermented wild leaves and Elderberry cordial. On this walk we will look at some favourite edible plants which grow along the wayside in an idyllic rural spot near Bath. We will discuss plants that are in season now, their medicinal uses and some recipes with which to impress your friends and family. As well as trying some of the plants we find, you will have a chance to sample some of my tasty chutneys, vinegars and syrups, all made from wild ingredients. On this wild food walk you will learn about all sorts of delicious edibles growing in the park. There will be discussion about the medicinal uses of plants, plus about how to turn your foraged ingredients into a tasty meal or three. During the walk there’ll be a chance to sample all sorts of tasty bits I’ve made from wild ingredients- chutneys, vinegars, syrups, fermented leaves, plus my wild garlic soup…or wild garlic frittatets…or something else I make on a whim the night before. I’ll also provide some refreshing cordial made from wild flowers. We’ll be concentrating on the carrot family with many delicious edibles, as well as some deadly members! Join me for a morning of coastal foraging along The Poet’s Walk, Clevedon. Discover and forage delicious, seasonal wild herbs and coastal vegetables. In the evening, relax and enjoy a vegetarian feast prepared by the Harty Suppers team – expect fresh, wild ingredients and wonderfully new flavours! *Note: The price includes both the foraging walk and evening meal- following our walk you will have the afternoon to yourself. We will meet again around 6.45pm at Harts Bakery. I will email all the information you need once you have booked. This will include: what to bring, what to wear and exactly when and where to meet. Learning in the fresh air; have fun picking lots of different leaves, flowers and seeds, all of which you can eat! Discover things you never knew about the plants growing right under your nose – in the park. With a super forager’s quiz and a chance to taste the things I make from the things I find – like my yummy syrups and cordials. This foraging walk will last around one and a half hours. Although aimed at children these walks will have lots of interesting information for adults too. Grown ups welcome but must be accompanied by a child! On these wild food walks you will learn about all sorts of delicious edibles growing in the park. We will look at fruit which can be foraged later in the season and put to good use in the kitchen. There will also be discussion about the medicinal uses of plants, many of which can be used to help build resistance to colds and flu during the Winter months. Bring a friend, a camera and a sense of adventure. On our walk you can sample some of my tasty chutneys, vinegars, syrups etc, all made from wild ingredients. On our mushroom hunts we will look at safe identification of fungi, preferred habitats of different species, what to eat and what not to eat plus I will give you some ideas for turning your foraged ingredients into tasty meals.